The development of better orthopedic implants is incessant. While current implants can function reliably in the human body for a long period of time, there are still a significant number of cases for which the implants can fail prematurely due to poor osseointegration of the implant with native bone. Increasingly, it is recognized that it is extremely important to facilitate the attachment of osteoblasts on the implant so that a proper foundation of extracellular matrix (ECM) can be laid down for the growth of new bone tissue. In order to facilitate the osseointegration of the implant, both the physical nanotopography and chemical functionalization of the implant surface have to be optimized. In this short review, however, we explore how simple chemistry procedures can be used to functionalize the surfaces of three major classes of orthopedic implants, i.e. ceramics, metals, and polymers, so that the attachment of osteoblasts on implants can be facilitated in order to promote implant osseointegration. The nanotopography of stem cell culture substrates has recently been recognized to play a major role in determining the differentiation outcome of stem cells,(33) a complex process in which nanotopography exerts its influence on stem cells by affecting the focal adhesion forces the stem cells sense on the substrate surface. (34) Perhaps unsurprisingly, the nanotopography of hydroxyapatite ceramics(35) and titanium(36) have been found to greatly influence osteoinduction of BMSCs and mesenchymal stem cells (MSCs). However, in addition to the nanopatterns on the substrates, the molecules attached to the surface of the nanopatterned surface also affect stem cell differentiation. This is clearly borne out by the weak influence that even a well-defined nanopatterned surface of poly(methylmethacrylate) (PMMA) has on the osteoinduction of MSCs. (37) On the other hand, synergistic effect on osteoinduction have been observed when BMP, which can accelerate osteogenic differentiation,(38, 39) were immobilized on poly(glycidyl methacrylate) (PGMA). 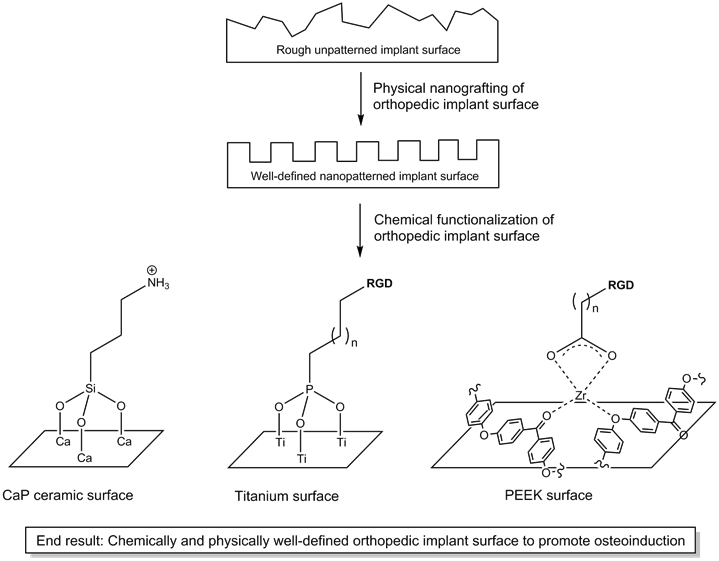 (40) Hence, it is clear that chemical functionalization of implant surface should be combined with well-defined nanopatterned implant surface to achieve maximal promotion of osteoinduction (Figure 1). As Benoit et al. have shown, functional groups ranging from amine, phosphate, fluorobutyl to carboxylic acid on poly(ethylene glycol) (PEG) hydrogels direct human mesenchymal stem cells (hMSCs) into divergent differentiation fates. (41) Not surprisingly, and as observed before,(42) the phosphate-functionalized PEG influences hMSCs down the osteogenic pathway. Such an influence of chemical functional groups on stem cell differentiation is also observed with the surface of glass; in this case, amine- or thiol-functionalized glass surface is able to promote osteogenesis of bone marrow-derived MSCs. (43) In these two examples, due to the presence of primary chemical groups (methacrylate and hydroxyl on PEG and glass surface respectively), they are relatively easy to functionalize with secondary chemical groups. However, there are many materials used to assist bone repair that are not readily functionalized, e.g. ceramics, metals and polymers. The following sections illustrate how these three types of materials can be functionalized via simple chemistry procedures in order to facilitate attachment of stem cells to promote bone growth. Illustration of how physical and chemical modifications can together create an osteoinductive implant surface for osseointegration. Despite the biocompatibility of ceramics with bone, the brittleness of ceramics is a major drawback. In this regard, metals hold a significant advantage. Titanium is one of several metals (iron, cobalt, chromium etc.) that are used in alloys for the fabrication of orthopedic implants because it possesses many desirable properties - high load-bearing capacity, compatible elastic modulus to native bone,(58) high corrosion resistance,(59) and good biocompatibility. (60) However, in a small number of recipients of titanium implants, allergic reactions in response to the implants were observed. (61, 62) In order to minimize such allergic reactions, it is necessary to osseointegrate the implant with the native bone, viz. the new bone tissue should be able to grow naturally on an osteoconductive titanium implant surface. The surface of titanium is normally coated with a tight layer of inert titanium dioxide that protects the underlying titanium from further oxidation. Such an interface does not interact chemically or biologically with cells. Thus, there is a need for an efficient method to activate the titanium surface toward stem cell attachment. As with metals, the key to adapting hard polymers for orthopedic applications is to activate the surface so that a layer of cell-adhesive RGD can be attached, and zirconium tetra(tert-butoxide) has proven useful in this regard. Zirconium tetra(tert-butoxide) can react with relatively unreactive functional groups such as amide, carbamate, imide, and even ketone/ether linkages of nylon 6/6,(73) polyurethanes,(74) polyterephthlates,(75) and poly(aryl-ether-ether-ketone) (PEEK)(76) respectively, permitting the facile surface activation of these hard polymers. Via this method, about 40% of the nylon 6/6 surface can be functionalized with RGD,(73) a drastic improvement from previously reported values. Such an RGD-functionalized nylon 6/6 is stable to aqueous hydrolysis at pH 7.5 (up to 7 days) and facilitates the surface adhesion and spreading of NIH3T3 cells. The polyurethane surface of tecoflex®, an important material in the fabrication of synthetic vascular grafts to bypass atherosclerotic blood vessels, can be similarly functionalized to achieve up to 25% surface coverage by RGD and consequent cell attachment. (74) Such surface functionalization can thus reduce the incidence of biofouling on tecoflex® and render the vascular graft much less thrombogenic. And as with nylon 6/6 and polyurethanes, the surface of polyterephthlates can be activated and coated with a zirconium intermediary layer, which can be treated with copper sulfate and chemically reduced to metallic copper. (75) So tightly bound the metallic copper is on the polyterephthlate that the plastic material can be vigorously flexed without breaking off the copper layer. Such metal-coated plastics will be very useful for the fabrication of organic electronic devices. The ease with which the surface of hard polymers can be activated by zirconium tetra(tert-butoxide) makes it possible to adapt poly(aryl-ether-ether-ketone) (PEEK) as a support for the growth of new bone tissue. Despite ether and ketone being weak ligands, the zirconium intermediary layer on the PEEK surface is still stable to hydrolysis and capable of more than doubling the interfacial shear strength of PEEK. (76) As expected, attachment of RGD onto the zirconium intermediary layer enhanced the osteoconductivity of the PEEK surface. In order to facilitate bone tissue growth, it is desirable that the osteoblasts are guided to grow unilaterally to reproduce the anisotropic nature of bone. With the utility of photolithographic methods, striped patterns of self-assembled monolayer of phosphonates can be laid on polymers to direct growth of cells only along the long axis of the stripes. (77) The patterned surface permits the ECM secreted by the cells to be aligned along the long axis, permitting even decellularized surfaces to continue to be capable of aligning cell growth. (78) A very important feature of this technique is that it is readily scalable, meaning that the technique can indeed be used to coat large (polymeric) replacement bones. The utility of stem cells in bone tissue engineering has made great strides, although there are certainly still hurdles to be overcome. As BMSCs are essentially a heterogeneous mixture of cell lineages, more efficient methods for the isolation, purification, and ex vivo expansion of clinical grade BMSCs are needed so that the potency and efficacy of these cells can be improved. As we have also seen, both the physical nanotopography and chemical functionalization of material surface play important roles in determining the success of BMSC osteoinduction and osteoblast attachment, especially for metals and polymers. Thus, it has become possible to make superior composites out of ceramics, metals, and polymers, utilizing the qualities of each type of materials without having to be overly concerned with the osseointegration potential of the resultant composite. Thus, the next challenge is to produce chemically enhanced nanotopographically well-defined surfaces on the orthopedic implant. The synergistic effect of both physical and chemical features can be expected to accelerate the osseointegration of the implant. S.Z. thanks the National Key Basic Research Program of China (2015CB352006), the National Natural Science Foundation of China (61275006 and 61335011), the Fujian Provincial Youth Top-notch Talent Support Program, the Natural Science Foundation for Distinguished Young Scholars of Fujian Province (2014J06016), the Program from Education Bureau of Fujian Province (JA13060), and the Program for Changjiang Scholars and Innovative Research Team in University (Grant No. IRT1115). All authors participated in developing the ideas presented in this manuscript. Kiat Hwa Chan and Ming Ni conducted the literature research. Kiat Hwa Chan wrote the manuscript. Shuangmu Zhuo and Ming Ni provided valuable suggestions in content and structure of the manuscript. Shuangmu Zhuo performed final editing of the manuscript. All authors read and professionally approved the manuscript. The authors declare no conflict of interests in this article.